There are 4 levels of organization I would recommend. 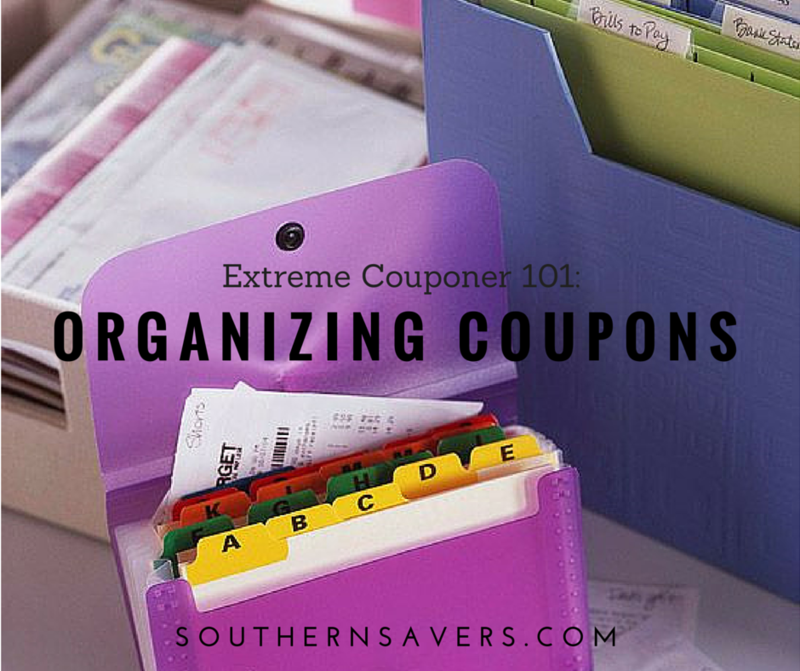 They go up in order of time involved to organize but they also each make the time spent finding the coupon faster. So you decide the system best for you and the time trade off. The pictures below go in order of system type. When you get your weekly inserts write the date bigger on the front page of the insert. Then get a large 13 pocket accordion file system and put all the inserts from this week together in one pocket. Next week put those inserts in the next pocket of the folder. As the weeks go on you have all the inserts from each week together organized back by the date that they came out. If you buy more than one paper, just put all the inserts no matter how many into the same pocket. Now when you come to Southern Savers you will use the SS dates that are next to coupons on the weekly deal posts to find each coupon and cut it out before going to the store. This is where I live. There are not any more hours in my day and this is a compromise with my husband. I do not recommend this system to anyone that hates to miss a clearance or closeout deal in the store. You can take your large file with you but you will spend way to long finding the coupon you need (if you even can find it). The upside too this system is that the only time spent on it, is the time you spend getting ready for your trip. Usually takes me about 15 minutes to cut any coupons needed for a trip. You will also need to have #2 to keep any coupons that you cut and don’t use or any printable coupons in. This is one small step towards organization. Get a small accordion file with 13 pockets (these are $1 at Target normally). Leave the front pocket empty and as you plan your trip you put the coupons there that you will use that trip, then in the remaining pockets label the tabs on them according to the areas that you use the most. I use: Baby, Canned/Boxed Goods, Cereals, Desserts/Baking, Snacks/Drinks, Other food, Toiletries, Drugs, Paper goods, Cleaning products, Refrigerated, and lastly Frozen foods. I DO NOT recommend organizing by alphabetical or expiration date. If you choose alphabetical then you are the only person in the world that knows where that coupon is. B for Betty C for Crocker or P for Potatoes. If you try expiration date then you are helpless if you need to find the coupon. (It is okay to let a coupon expire by the way, you will probably get another very soon and it really means that they item never came on a great sale). This system is fast on the time it takes to organize them, you cut put them in twelve stacks and shove them in. It is slow on the time it takes you in the store. Your stacks will be large. If you need to find a coupon for canned chicken you might have 30-40 coupons to look through. Another problem with this system arises if you get more than one copy of the paper. Your stacks of coupons are now really large and time in the store slows even further. Yet another step closer to mastering organization. For this system find any box you like. I recommend something that can fit easily in the top part of the grocery cart. Then buy or make your own dividers. You can go to town with dividers and make categories for anything you like. You will increase the amount of time it takes to organize your cut coupons, but in the store you will have smaller stacks to sort through to find a particular coupon. I made my own box and used a 3×5 index card file box, they sell dividers for it and it had a lid! For my categories when I finally moved out of the box I had over 40 dividers with everything from Baby to Personal Care Supplies I don’t use (just in case it was free). The only downside with this system is that no matter what size box you pick, a box is a box and it will not expand. If you get a lot of inserts you will not be able to get every coupon inside at some point. This system is for the truly serious and devoted. You need a 1.5 inch or larger 3 ring binder, baseball card organizing pages, and section divider tabs. Label the dividers again by location in the store and then start to put coupons into the baseball card pockets. Place your coupons individually (put multiples behind it) in the slots so that you are able to see every coupon. I put a coupon facing the front and a different coupon facing the back to maximize space. For the dividers, you are not limited by 12 sections so you can go crazy with tabs if you like. You can even get a little zipper bag (sold to hold pencils) to put in the front to hold your coupons for that trip and a pair of scissors. This system takes the most time to get everything organized. It is coupon origami getting some of the large coupons in the slots. However, in the store if you were racing against anyone in a lower system you would win hands down. If you need to know if you have a particular coupon it will take you about 5 seconds! You will also be ready to make a run to the store for a quick deal rather then feeling like you have to sit down and prepare. Buy a folder that zips up!! If you hold a binder upside down the coupons will fall out the top. Look for a binder that has a 6 pocket accordion system too. Now if you cut and don’t have time to file the coupons you can still have them with you. My Favorite Binder I found at Office Depot, they don’t have one of their site so here is a similar one if you are interested in cost and features. What method do you use to organize coupons?